Overwhelming support and record turnout among black voters and her best showing to date among whites gave Hillary Clinton a powerful victory in Saturday’s Democratic presidential primary in South Carolina. 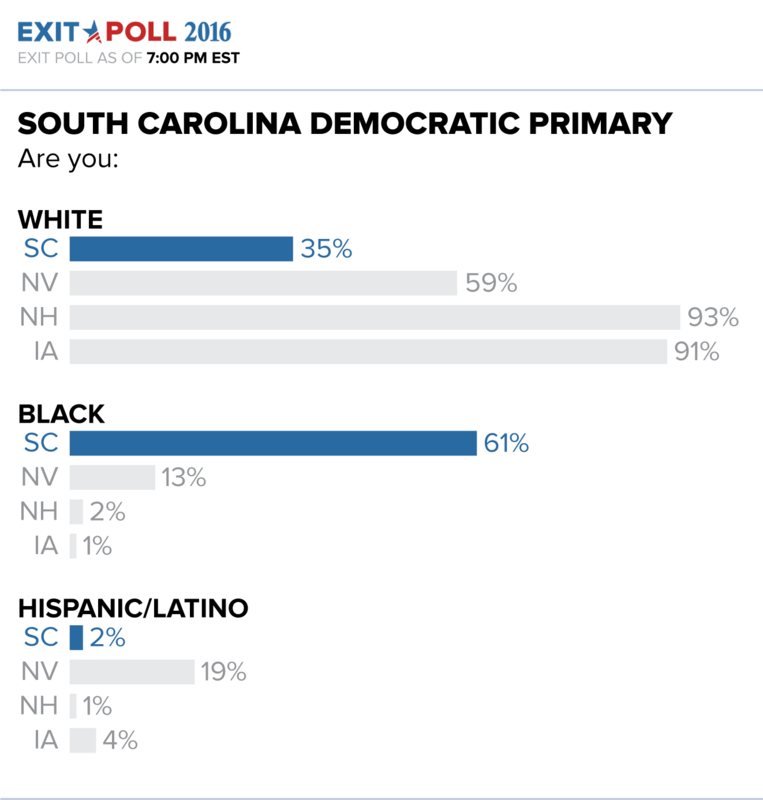 Blacks accounted for 61 percent of South Carolina Democratic primary voters in ABC News exit poll results, breaking the state’s record, 55 percent in 2008. And Clinton won 86 percent of their votes, a crushing score. 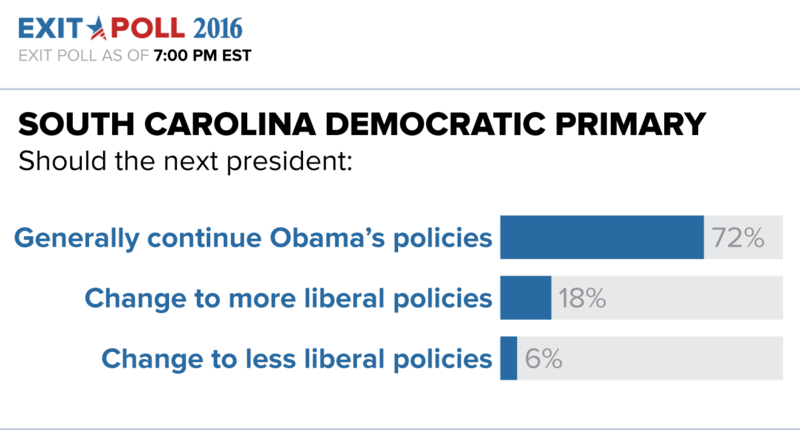 Indeed she did significantly better with blacks in South Carolina than Barack Obama in 2008. Clinton won whites by a far narrower margin, 8 points – but that was good enough for her best result among whites so far this year. She lost whites younger than 45 by nearly a 2-1 margin and white men by 12 percentage points, but here white men made up just one in seven voters. There were a few somewhat sour notes for Clinton. Four in 10 whites did not see her as honest and trustworthy. And as in previous states, Sanders won whites focused on honesty, as well as those most concerned with a candidate who “cares about people like me,” by vast margins – 91-9 and 66-34 percent, respectively. Clinton’s big margin of victory relied on the fact that whites were in the minority, and the state’s black voters were all about her. Blacks accounted for seven in 10 of her supporters, while whites made up two-thirds of Sanders voters. Eighty-three of blacks saw Clinton as trustworthy, while just 52 percent said that about Sanders. 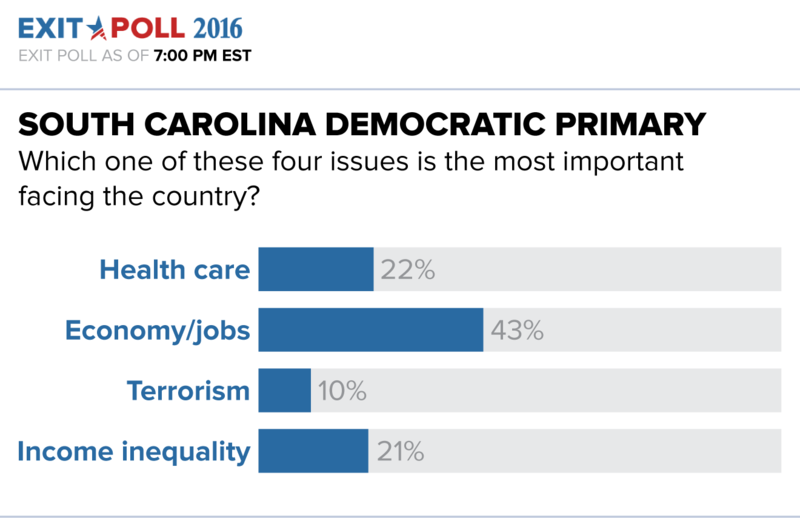 And while 88 percent of blacks said they trusted Clinton to handle race relations, fewer than half, 48 percent, trusted Sanders on this issue. Turnout among blacks seemed to answer whether they’d show up for Clinton (at least proportionally) as they did for Obama; further, as noted, her 86 percent support among blacks exceeded his 78 percent in the state’s primary in 2008. That said, also winning whites – which Obama failed to do here eight years ago – put an exclamation point on Clinton’s results. Still the racial divide in the state was unmistakable. Eighty-eight percent of black voters said they want the next president to continue Obama’s policies, a strong support group for Clinton. By contrast, half of whites favored continuing Obama’s policies; 34 percent instead were looking for more liberal policies than Obama’s, a central element of Sanders’ appeal. In addition to liberals, turnout among whites included a substantial number of political independents – more than a quarter of whites in this Democratic primary – and Sanders won them by nearly 2-1, 64 to 36 percent. 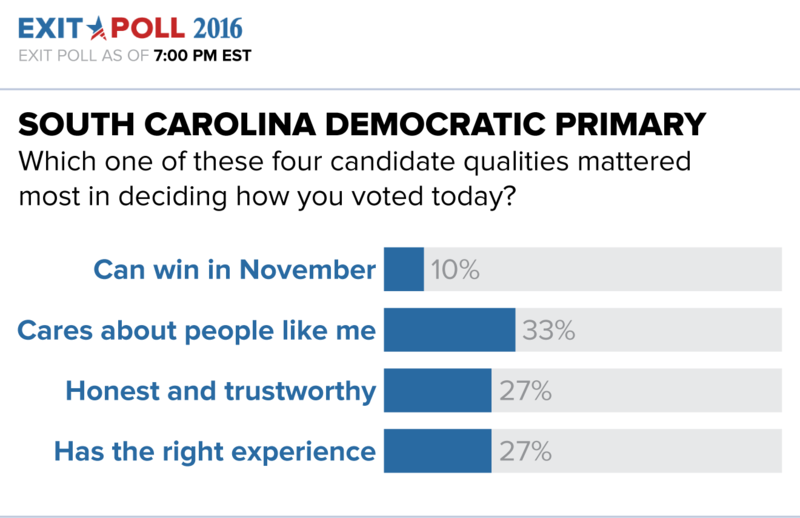 Clinton won white Democrats, 63-37 percent (another result that grew more comfortable for her in later data). Voters younger than 30, a huge group for Sanders in earlier contests, accounted for 15 percent of South Carolina voters, vs. 18 or 19 percent in the three previous states. He won them by just 54-46 percent Saturday, down from 4-1 in earlier contests. 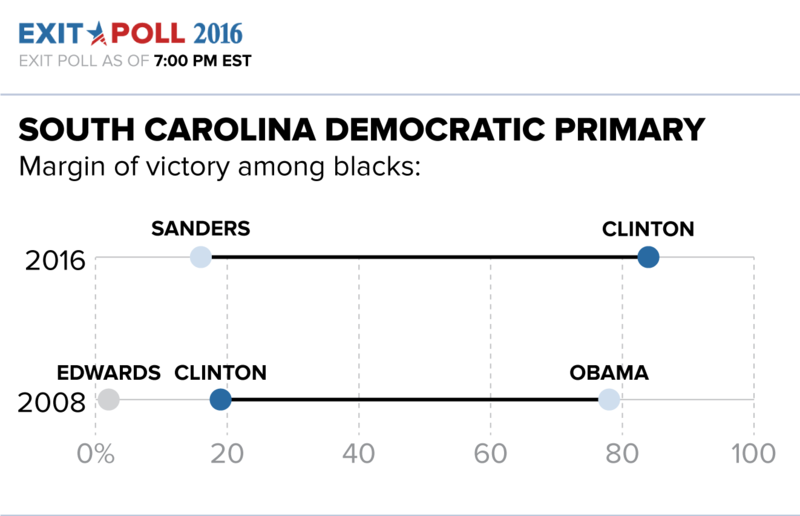 The chief difference, again, was blacks: South Carolina blacks under age 30 went for Clinton by 62-38 percent. Expanding the age range, Sanders won whites younger than 45 by 64-36 percent, somewhat closer than in previous races. Clinton won whites age 45 and older – 63-37 percent vs. Sanders – and the latter group accounted for a far larger share of white voters overall, 65 percent. Gender gaps were impressive in terms of turnout and vote preference alike. White men, as noted, accounted for just 14 percent of voters; black women accounted for 37 percent. Clinton won white women by 60-40 percent, while losing white men, 44-56 percent. The gender gap among blacks was much more muted: Clinton won black women by 78 points, black men by 64. Analysis by Gary Langer, with Gregory Holyk and Chad Kiewiet de Jonge.